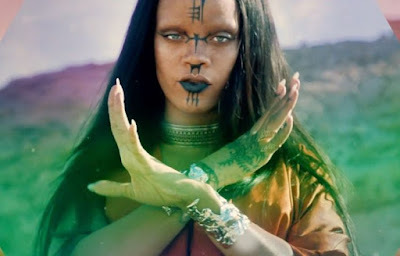 Rihanna released her for video for "Sledgehammer" today and lets just say that the video goes perfectly with the movie Star Trek: Beyond. The video was released via IMAX, making it the first music video to be shown in those theatres. In the video, Rihanna gets in touch with the extraterrestrial side of things. From the scenery, to her flowy jumpsuit, Rih was able to get right into character for this video. I can only imagine that this video and song excited the singers whole life since she says that she has been a Star Trek fan since her childhood years. Rih is clearly not resting anytime soon. She has been featured in a few collabos, on top of dropping her own new music and videos, all while touring (she is currently on her European leg of the tour). The video will show in IMAX Theaters before the showing of The Legend of Tarzan. Watch the video below and let me know if your feeling it.